Merging has been long respected in the pro recording industry with mastering engineers such as Bruce Brown using the company's Horus network audio converters in his studio. 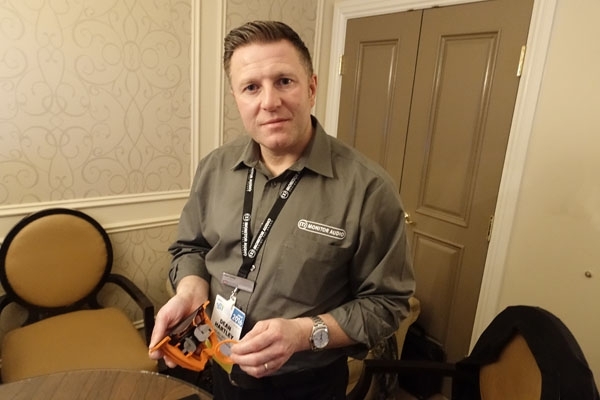 They have also been instrumental with DSD recording technology, so not surprising when I saw the new NADAC in Philip O'Hanlon's On a Higher Note suite at the very top of the Mirage hotel, Philip being a big DSD proponent himself. You have to wonder what gets into some of these otherwise normal audio companies like Cary. Did they just hire a twenty-something in the design department? Did the VP have an acid trip one weekend? 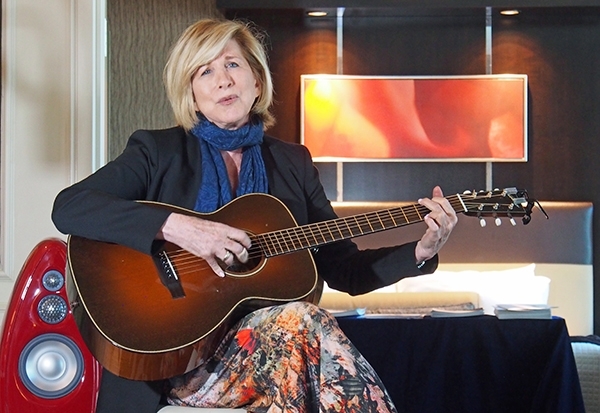 For a select group of invitees, Philip O'Hanlon hosted two performances in On a Higher Note's Mirage suite with fabled singer-songwriter Lori Lieberman ("Killing Me Softly with His Song.") Lori entered the suite to rehearse while I was listening to recorded music, and began singing unamplified while Philip and I were in the next room discussing the products on display. I had to stop talking. It is rare that I find myself in the presence of a singer whose every sound expresses the depth of her soul. What an artist. To say that I was transfixed is an understatement. 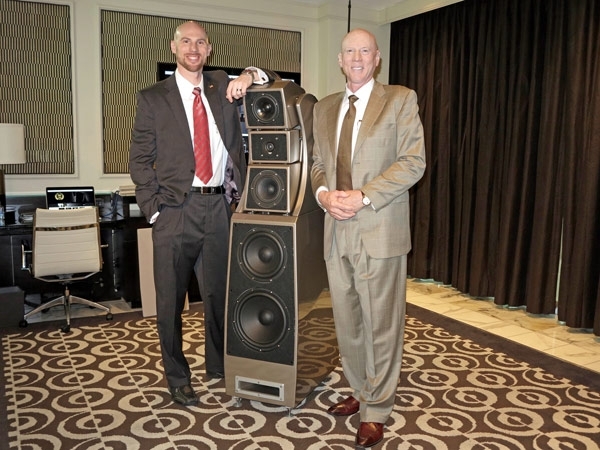 I'm familiar with how opening or closing a side entrance to a music room can affect bass loading, But when Philip O'Hanlon of A Higher Note demonstrated how opening the sliding doors behind the new Vivid B1 Decade loudspeakers ($28,000/pair) increased air and spaciousness, I was duly impressed. 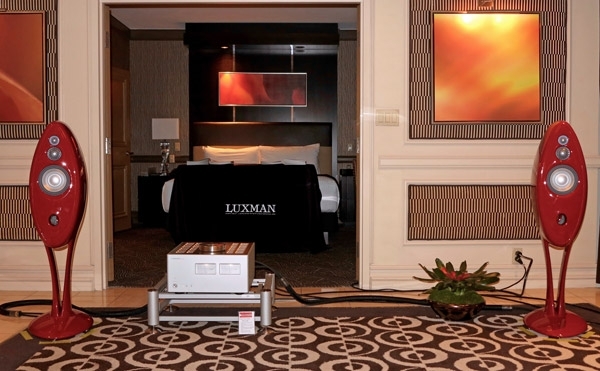 Luxman's L-590 integrated amplifier features amplifier circuitry with Darlington-connected devices and the company's proprietary distortion-reducing ODNF (Only Distortion Negative Feedback), which isolates noise and distortion at the output of the music signal, and uses only a touch of negative feedback to suppress them. 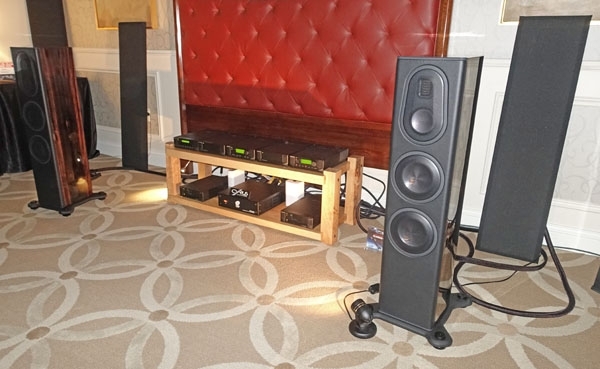 Dan D'Agostino Master Audio Systems' newly upgraded Momentum monoblocks, now called the Momentum M400 monoblocks ($65,000/pair, and shipping now), sounded fantastic in the dCS Suite in the Mirage. The photo is slightly deceptive, because this early-issue pair is housed in the slightly different, original Momentum chassis, but who cares? The mating of D'Agostino Momentum400 monoblocks with Wilson Audio Alexia loudspeakers, Transparent Audio Generation V cabling, HRS SXR isolation system with new Vortex isolators, Meletzsky Stromtank power supply system, and the newly upgraded dCS Vivaldi DAC system delivered the most color-saturated, full-range, impactful, emotionally satisfying and frankly wondrous sound of any room I visited at CES. While I left coverage of the newly upgraded dCS Vivaldi stack and the recently released Rossini player (which John Atkinson will review) for Jon Iverson's time in the dCS suite with Graham Nash, I will note that its new filters and upgraded Ring DAC software algorithm (which includes the ability of the original dCS mapper to run at two different speeds), together with advanced word-clock management and signal processing, produce a readily noticeable improvement in sound. 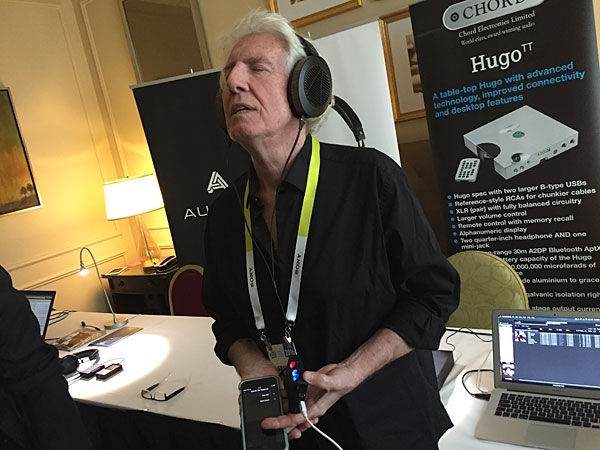 We'll be detailing all of the rooms that Graham Nash visited at CES in the next week, but before we get started, here's a small detour that took place about halfway through the day. Sometimes, even in audio, numbers do speak for themselves. I reviewed the Rogue Sphinx ($1395) almost two years agoand still, everyday I like it more. The Sphinx continues to deliver more quality sonics (into a wider variety of speaker loads) per dollar than any amp I ever knew. Now they appear to have accomplished the same thing againthis time it is a beautiful little $1695 preamplifier called the RP-1. Taking a photo of a single speaker for a show report presents a challenge, especially if the speaker is narrow and tall. 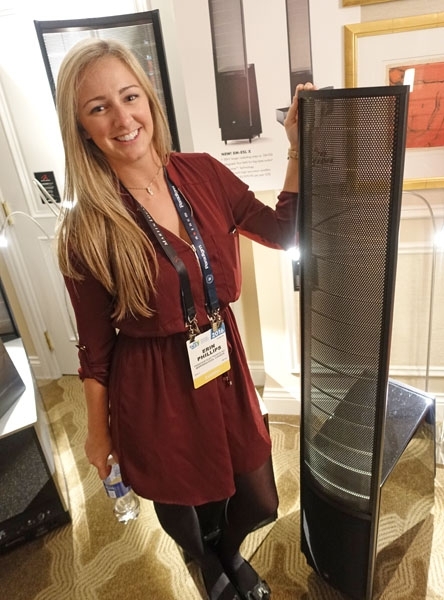 In the case of the new MartinLogan EM-ESL X, the flagship of the ElectroMotion series (at $3995/pair, I make it close enough to $4000 be part of my territory), I solved the problem by enlisting the help of the uncommonly photogenic Erin Phillips, Communications Manager for MartinLogan and Paradigm. With two years in research and development, Monitor Audio's Platinum Series II involvesaccording to Dean Hartley, Monitor Audio's Technical Director"advances in every area of design: electrical, mechanical, magnetic, acoustic and aesthetic." The Monitor Audio Platinum II involves some major improvements in driver technology. Dean Hartley told me that they had moved a good way towards completion of these changes when the original Platinum Series speakers were introduced, but they felt that further improvements were possible, and they wanted to be absolutely sure they got it right, so they played it safe by going with the existing technology.